KBB.com Brand Image Awards. Only 26,292 Miles! Delivers 21 Highway MPG and 15 City MPG! 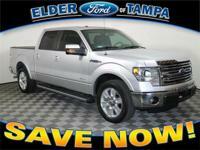 This Ford F-150 delivers a 3.5L V6 ECOBOOST ENG engine powering this Automatic transmission. Variable interval wipers, Under frame winch-type spare tire carrier w/safety catch & lock, Two-tone painted front/rear step bumper. * This Ford F-150 Features the Following Options * Trailer sway control, Tire pressure monitoring system, Tilt steering column, SYNC voice activated communications & entertainment system -inc: Bluetooth capability, steering wheel audio controls, media hub w/(2) USB ports, audio/video input jacks, SD card reader, 911 assist, vehicle health report, SYNC services (subscription required) w/GPS based turn-by-turn driving directions & traffic reports & info services, SOS post crash alert system, SiriusXM satellite radio *N/A in AK or HI*, SecuriLock passive anti-theft system (PATS), Safety Canopy front/rear outboard side curtain airbags, Removable tailgate w/key lock & lift assist, Remote keyless entry key. * Expert Reviews! 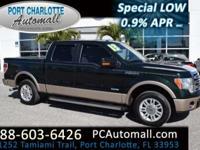 * As reported by KBB.com: If you like variety and choice, the 2013 Ford F-150 offers the most comprehensive lineup in the industry. High-end interiors and cutting-edge infotainment and audio options further distance the F-150 from other trucks. 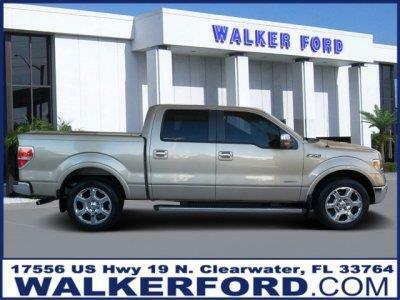 * Visit Us Today * Come in for a quick visit at Walker Ford, 17556 US 19 N, Clearwater, FL 33764 to claim your Ford F-150! Walker IS Ford! Invoice Pricing? Employee Pricing? Tired of the gimmicks? Get the lowest price, the best customer service and HUGE selection every time at Walker Ford. Stop in today, we are conveniently located off US 19 in Clearwater, view the map for direction, and don't forget to check out our 5 star reviews while you're at it! Fuel Consumption: City: 15 Mpg|Fuel Consumption: Highway: 21 Mpg|Memorized Settings Including Door Mirror(S)|Memorized Settings Including Pedals|Memorized Settings For 2 Drivers|Driver Seat Memory|Remote| Digital Keypad Power Door Locks|Power Windows|Cruise Controls On Steering Wheel|Cruise Control|Trailer Hitch|4-Wheel Abs Brakes|Front Ventilated Disc Brakes|1St And 2Nd Row Curtain Head Airbags|Passenger Airbag|Side Airbag|Wireless Phone Connectivity|Digital Audio Input|In-Dash Single Cd Player|Sync With Myford Touch|Mp3 Player|Siriusxm Am/Fm/Satellite Radio|Radio Data System|Siriusxm Satellite Radio(Tm)|Speed Sensitive Audio Volume Control|Total Number Of Speakers: 4|Power Adjustable Pedals|Abs And Driveline Traction Control|Stability Control With Anti-Roll Control|Privacy Glass: Deep|Silver Aluminum Rims|Wheel Diameter: 18|Wheel Width: 7.5|Front Fog/Driving Lights|Leather Steering Wheel Trim|Urethane Shift Knob Trim|Simulated Wood/Metal-Look Dash Trim|Simulated Wood/Metal-Look Door Trim|Video Monitor Location: Front|Trip Computer|External Temperature Display|Tachometer|Manufacturer's 0-60Mph Acceleration Time (Seconds): 6.9 S|Hd Auxilliary Transmission Cooler|Driver's Side Electrochromatic Auto-Dimming Mirrors|Power Remote Driver Mirror Adjustment|Heated Driver Mirror|Heated Passenger Mirror|Electrochromatic Rearview Mirror|Power Remote Passenger Mirror Adjustment|Turn Signal In Mirrors|Dual Illuminated Vanity Mirrors|Compass|Driver And Passenger Heated-Cushion| Driver And Passenger Heated-Seatback|Audio Controls On Steering Wheel|Front And Rear Reading Lights|Anti-Theft Alarm System|Leather Seat Upholstery|Front Split-Bench|Split Rear Bench|Fold-Up Cushion Rear Seats|Rear Seats Center Armrest|Tilt-Adjustable Steering Wheel|Speed-Proportional Electric Power Steering|Suspension Class: Regular|Automatic Front Air Conditioning|Dual Front Air Conditioning Zones|Tire Pressure Monitoring System|Remote Activated Exterior Entry Lights|Max Cargo Capacity: 60 Cu.Ft.